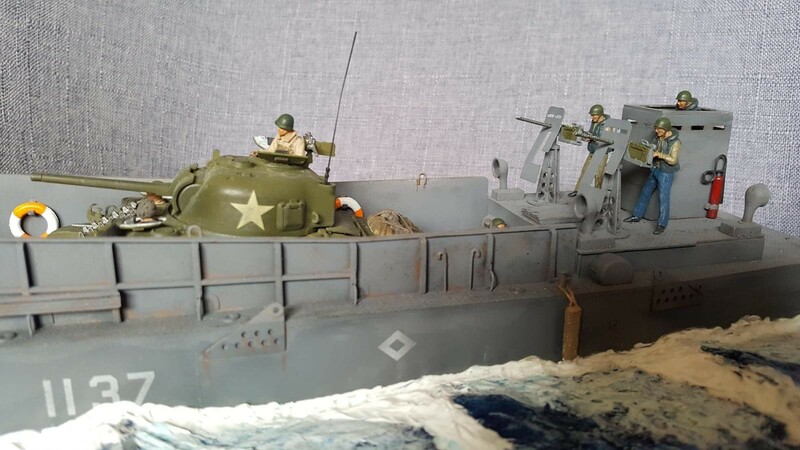 Something I have always wanted to do is a D-Day US Navy LCM (Landing Craft Mechanized) but have always been worried about doing sea water. But when my local club said the group build was D-Day theme then it was time to conquer my ‘fear of the water’ so to speak. 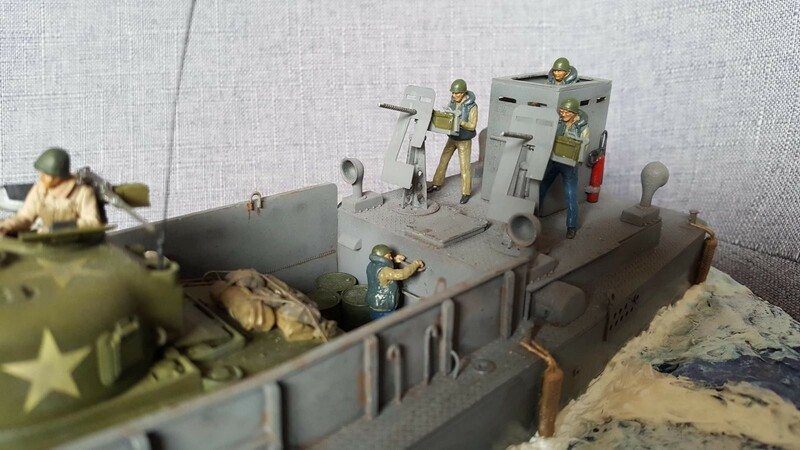 I decided 1/35th was going to be too big so went with 1/48th (which is still big for my limited display space). 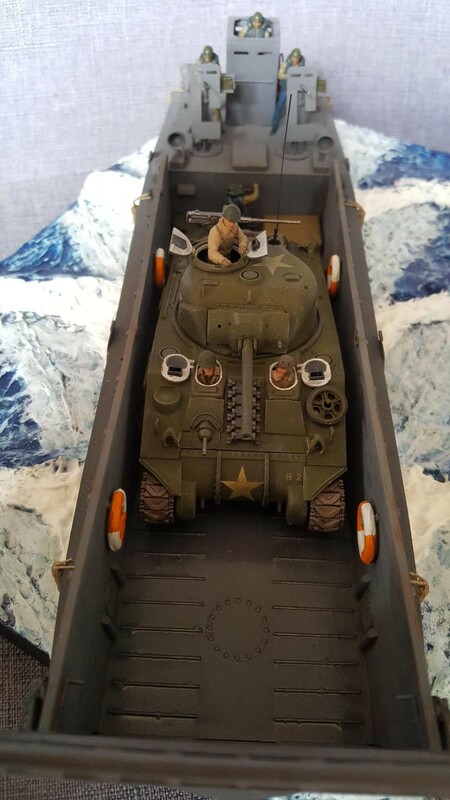 I purchased the Trumpeter LCM and Tamiya Sherman. 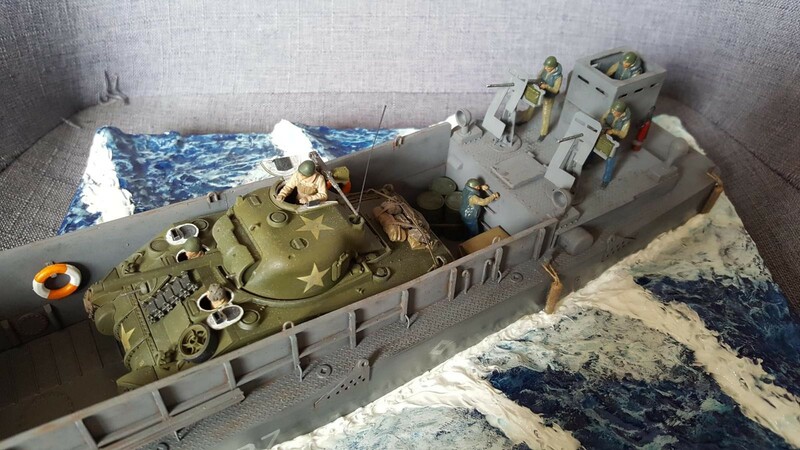 I also got the Verlinden tank crew – no problems so far. 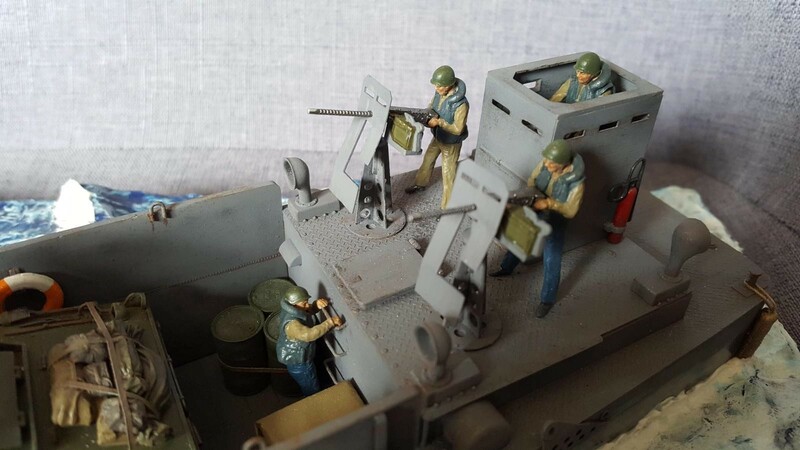 Then I wanted a crew for the LCM… problem, no one does a 1/48 LCM crew that I could find until I stumbled across a company that does 3D printing of figures called Shapeways so thought I’d give them a try. I wasnt sure what quality I was going to get but they are very good and even have detailed faces. Im pretty happy with result, 90% happy with water, but it shows the result I wanted so I’m happy with that. 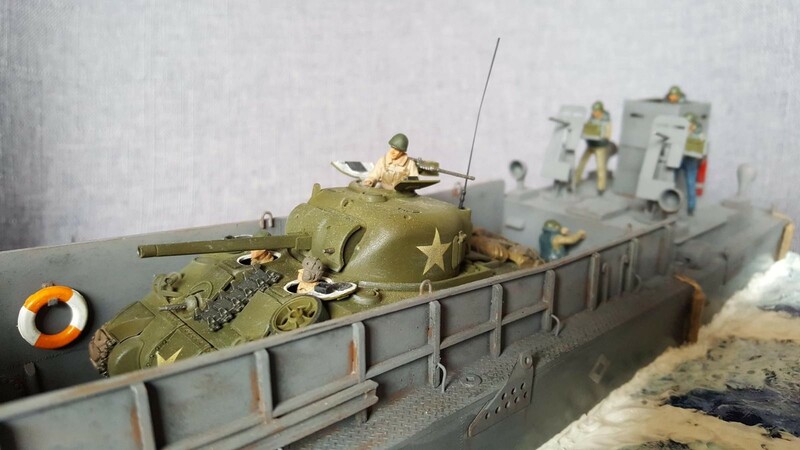 I think the hardest part was exercising restraint and not doing too much weathering on the tank as a lot of tanks used on the day were new or only had a few hours use in training under their belts before being deployed to Normandy. 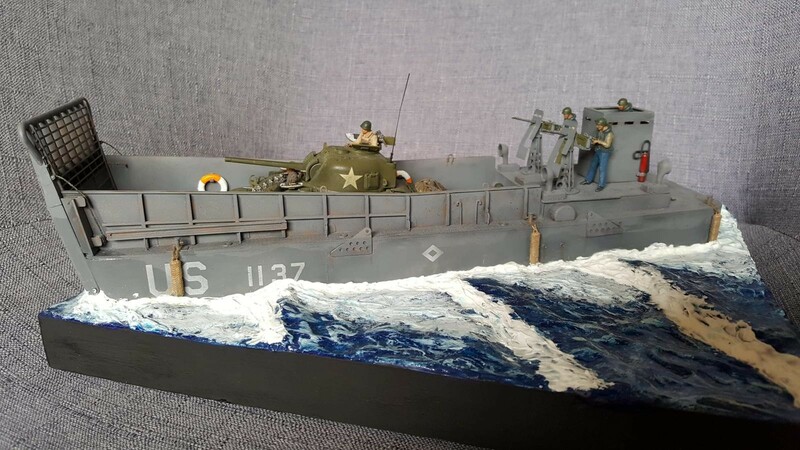 Outstanding diorama, Carl! I like the way you made the water … and the tank … and the LCM, too! Very nice all-around job, my friend….I like it a lot. Very nice work. You’ll “get” the water and lose your fear with more experience. Nicely done Carl, the water looks good as well. Carl, well done all around….including the water. Nicely done Carl. Good job! 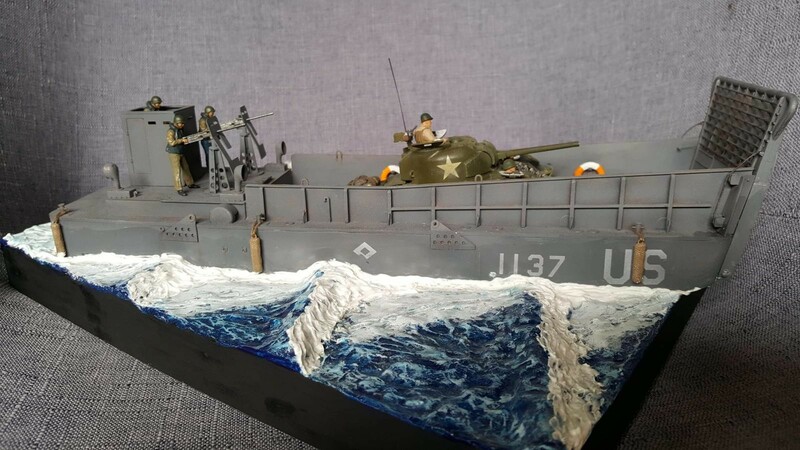 Great diorama! I think the water looks great. Nicely done Carl, looks good. Your water application resulted ok , for it being your first try at it, you did great. well done! – and fear the water no more – it is outstanding. My compliments with your first “Water” diorama. It looks good to me. Maybe old news, but I use (Liguitex) medium gel for the top layer of the water surface. Thanks Dirk. No I haven’t heard if that one, I’ll look it up. Dirk @orion how long does that paint take to dry? I would assume you lay it down pretty thick. You can fiddle around in it for 24 hours. So it sets very slowly. 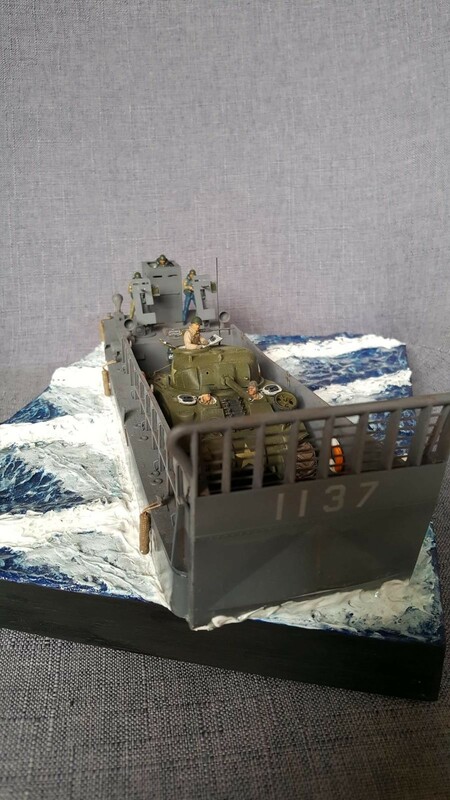 It is ideal for a diorama with a waterline model. For a full hull I follow a different build up of the water. 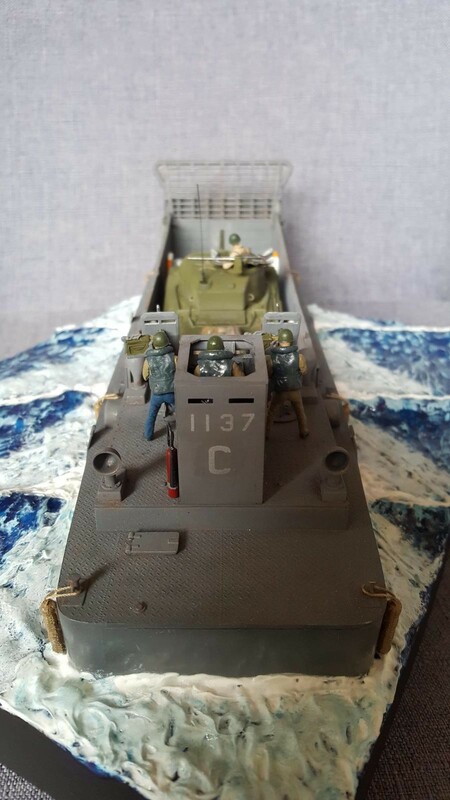 The carrier (see link is full hull in the “water”, but again the top layer is finished in Liquitex.